Nowadays, it is no longer possible to separate mind and body. Both the medical world and the psychological world indicate that physical pain sometimes can be a sign of a psychological problem. These complaints are also sometimes called psychosomatic complaints. Psychosomatic complaints are a combination of a physical vulnerability, which is magnified by psychological factors. Psyche stands for mind and soma stands for body. There are different physical illnesses, which can have stress or other psychological factors as their trigger. For example, emotions and stress can even cause pain and other complaints. Psychosomatic complaints thus are a consequence of psychological influences, which magnify the physical vulnerability. This combination will then lead to symptoms and complaints of pain. In the past, it was reasoned that mind and body work as two separate systems. Nowadays people are convinced that the two influence one another. Thus, physical pain can cause psychological problems and strengthen these such as depression or anxiety. The opposite is also possible. Pain is a commonly occurring expression of this link between mind and body. Psychosomatic complaints seem to occur more nad more commonly. You more and more often hear that no pure physical cause can be found for the physical pain which your neighbor, your partner, family members, people close to you,… experience. Therefore these people often look for a ‘second opinion’ and hope that this doctor will be able to find a cause. Even at this ‘second opinion’ people often get to hear that the doctors cannot formulate a clear answer. In that case, psychosomatic complaints might be at play. Are you imagining your pain? Psychosomatic complaints and problems were already added to the DSM, the diagnostic manual used by psychiatrists and psychologists. The pain is thus definitely not imagined. It can be so that you are told that the pain is in your head or that you are imagining the pain. This, however, is not true. Psychosomatic complaints, even though they are caused by psychological factors, can cause severe pain. What are the causes of psychosomatic complaints? As mentioned earlier, emotions and stress have a large influence on your body and can eventually strengthen psychosomatic complaints. Fights and conflicts, too, can lie at the basis of psychosomatic complaints. Overexerting certain mechanisms here goes together with stress and conflicts. If you, during a long time, do not feel good about something or worry, it can be so that you overexert certain psychosomatic systems. This can also give rise to psychosomatic complaints. It thus is useful to pick a healthy ‘coping style’. Everyone has to deal with difficult situations in their lives. That which matters, however, is whether you deal with these difficult situations in a healthy way. With healthy, we mean that it is good both for your mind and your body. Unhealthy methods include experiencing too much stress, worrying, and so on. These coping styles namely can trigger an overexertion or other psychological problems. What are the symptoms of psychosomatic complaints? What can I do about psychosomatic complaints? Because the cause of the psychosomatic complaints is a combination of physical vulnerability and psychological triggers, it is useful to consider different approaches. For some people it can be good to reduce their stress. For others, medical intervention is of more use. A combination of the two techniques is also an option, which helps many people with psychosomatic complaints. Learning to recognize psychosomatic pain complaints. This then helps reduce the frequency, duration, and intensity of the complaints mentioned above. Working on relapse prevention. This helps you to stay in control of psychosomatic complaints in the long-term. Learn today how you can work against your psychosomatic complaints and how you can live a more balanced life, in order to weaponize your mind and body against psychosomatic complaints! Except for the interventions above you can try to stay active, but still taking enough rest. It is useful to not over-exert yourself. 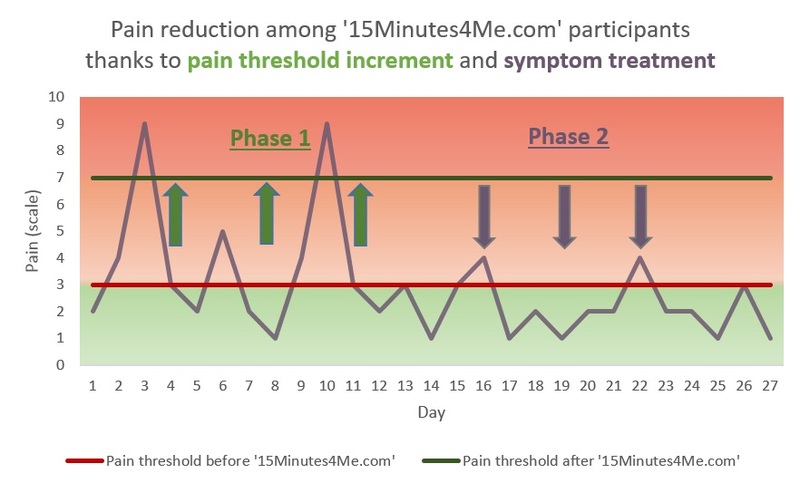 Combination medical intervention and “15Minutes4Me.com”? Sometimes it is useful to pick both techniques when it comes to treatment of psychosomatic complaints. Of course, it can occur that the cost of certain medical interventions is too large. With this, we think of certain side effects which might be linked to medical interventions. In that case it can be useful to mainly work on reducing stress. “15Minutes4Me.com” gives you the opportunity of following the program as it is, whether or not you decide to combine it with a medical intervention. Following a program regarding stress reduction thus is not the only possible intervention that can be taken to take care of psychosomatic complaints, but it does offer you freedom of choice. You are the one to decide which techniques you want to use in treating psychosomatic complaints. Would you like to know whether psychological factors might be a cause for your pain? Then take the free stress induced pain test here! Free Online Self Scan with Graphs! Test your Stress, Anxiety, Burnout or Depression and read how you can improve your scores. Personalized computer program developed by physicians. 15 minutes self-coaching a day during 1 month. If you desire you can choose for a longer period. Stress and fatigue? How are stress and fatigue linked? Sleeping problems? Causes, treatment, and test sleeping problems! Anxiety disorder? How an anxiety disorder is passed forward!